Series A5™ & A5 Fanback™ Chairs are the only aluminum polyfold chairs completely produced in the United States! The Series A5 Fanback™ Chair is a great choice for any event with its durable but affordable aluminum tubing. 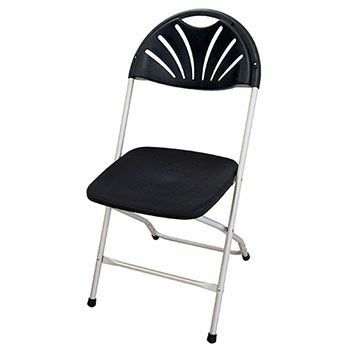 The lightweight folding chair is rust resistant with a powder coating. The tubing is pretreated in a 5 stage acid cleaning and phosphate surface treatment for enhanced corrosion resistance and preparation of the tube surface for maximum molecular bonding of the powder coating. This lets you know the Series 5 is weather resistant to maintain the paint’s smooth and glossy finish. These chairs both fold and stack, fitting perfectly in either McCourt's Tilt Stack Chair Truck or Flat Stack Chair Truck in 50+ high stacks. They are the only chairs (along with the Series 5™ Chair) that stacks while folded made in the USA, and McCourt prides itself on this fact. The Series A5 Fanback™ Chair also comes in a plethora of color options for both the frame and the seat colors. Choose from 96 different color combinations and match any venue! Impress your clients in your next rental arrangement with your options, and order your McCourt Series A5 Fanback™ Chairs today! Series A5 - .76” dia. x .084” anodized aluminum tubing for even lighter weight and greater rust resistance. Punches and bends are precision controlled with dedicated proprietary equipment. High strength cross braces of .625” dia x .049” thick tubing. All rivets, buttons, seat clips and seat plate are stainless steel. Seat & Back 100% Virgin Polypropylene with color blended throughout formulated with anti-static and ultra violet additives. Feet are Linear Low Density Polyethylene for high strength and foot retention. Available in Black/Black or White/White. Other color combinations available with minimum order. The Series 5 and Series A5 are manufactured in the USA with U.S. components and craftsmanship. Full 3 year limited warranty against manufacturing defects under normal use. McCourt Manufacturing will repair or replace (at our option) at no charge; customer assumes all freight charges.